Twitter use has grown exponentially within the urological community. We aimed to determine the perceptions of the impact of Twitter on users' clinical practice, research, and other professional activities. 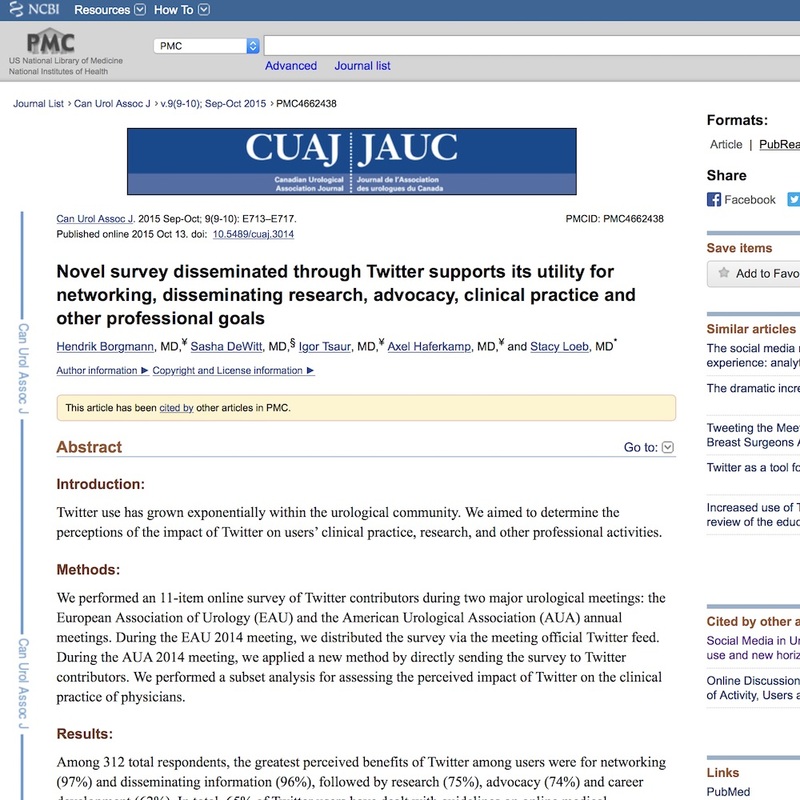 We performed an 11-item online survey of Twitter contributors during two major urological meetings: the European Association of Urology (EAU) and the American Urological Association (AUA) annual meetings. During the EAU 2014 meeting, we distributed the survey via the meeting official Twitter feed. During the AUA 2014 meeting, we applied a new method by directly sending the survey to Twitter contributors. We performed a subset analysis for assessing the perceived impact of Twitter on the clinical practice of physicians. Among 312 total respondents, the greatest perceived benefits of Twitter among users were for networking (97%) and disseminating information (96%), followed by research (75%), advocacy (74%) and career development (62%). In total, 65% of Twitter users have dealt with guidelines on online medical professionalism and 71% of physician users found that Twitter had an impact on their clinical practice, and 33% had made a clinical decision based on an online case discussion. Our results suggest that Twitter users in the urological community perceive important benefits. These benefits extend to multiple professional domains, particularly networking, disseminating information, remote conference participation, research, and advocacy. This is the first study that has been disseminated to targeted individuals from the urological community directly through tweets, providing a proof of principle for this research method.